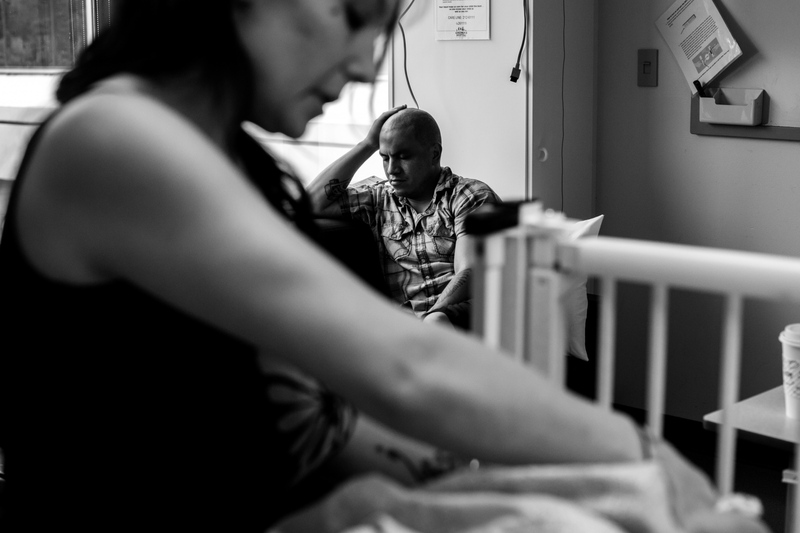 Jen breathes through a labor contraction at Legacy Emanuel Medical Center in Portland, Oregon. Because of the severity of Sky's defects, Jennifer was not able to have Sky in Alaska. She was told that while Sky was like any other baby in the womb, she may die soon after birth or need immediate invasive intervention. Barb Norton, a CNM who Jennifer calls her "honorary mother," continues to decorate the altar Jen has started for Sky in the backrgound. Barb, who runs the birth center where Jennifer works, flew down to Portland to be Jennifer's birth support. "Jennifer was the first person I hired when I started my center 14 years ago," Barb says. Jennifer decorates her labor and delivery room at Legacy Medical Center in Portland, Oregon on May 25, 2015. 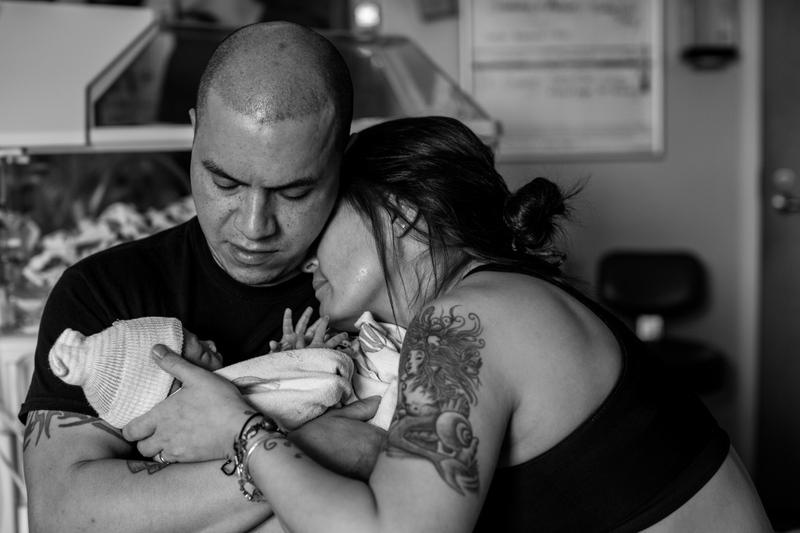 Jennifer, who is a nurse, childbirth educator, and doula has had two births in a birth center and one at home, so she wanted to make her birthing room in the hospital feel less sterile. Jennifer labors in the shower when her contractions become too intense. "I felt like I needed somewhere dark to hide," Jennifer says later. Sky's head is born. Jen's labor and natural birth was just a little over 2 hours, the fastest of all of her births. "I was getting ready to say good-bye," Jennifer says. "I was telling myself to be strong, and telling her to be strong, and I was telling her that I loved her. And I told her that I would carry her as far as she wanted to go." Sky is suctioned by the medical team shortly after birth. Jen reconnects with Sky while the cardiologist evaluates her. 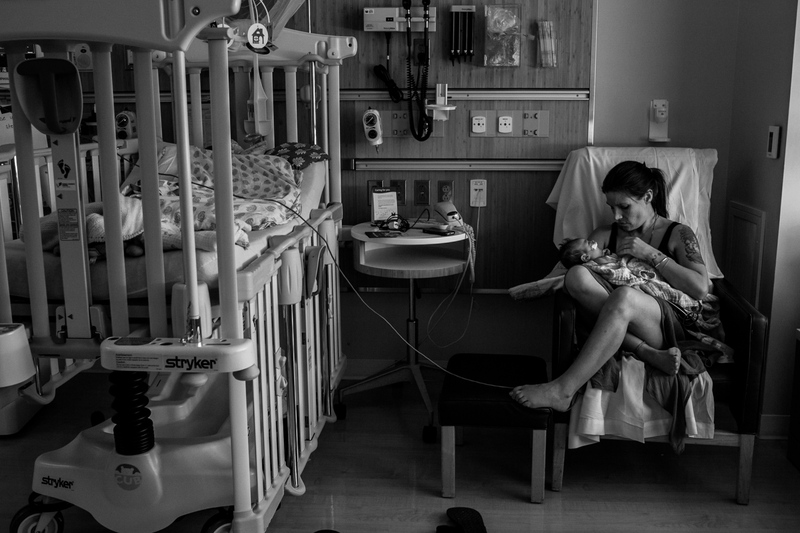 After delivering her placenta, Jennifer rushed down the hall to be with her daughter. Her husband, Aaron (right back), missed the birth. Jen says she knew he wouldn't handle Sky's birth well, but was still upset that he hadn't come and had remained distant. "I know it sounds bad that I wasn't all in right away," Aaron says later in an interview, "but I knew that Jen and I both couldn't be a total wreck. 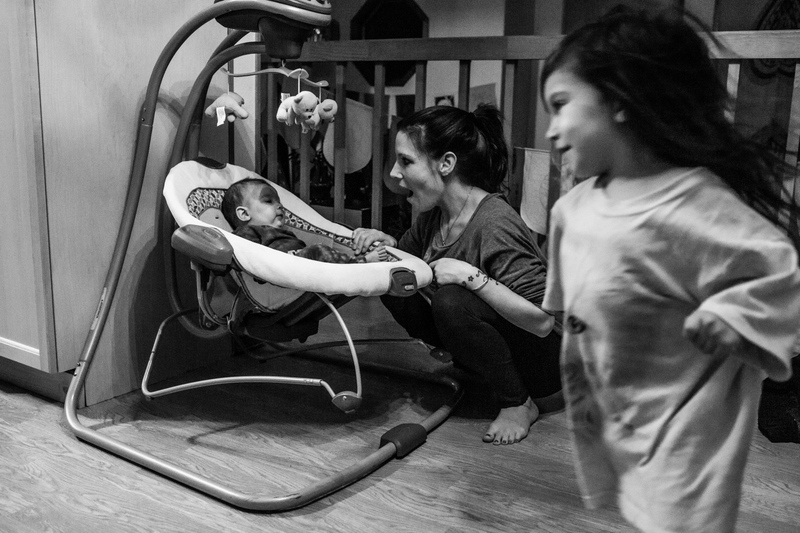 I knew that Jen and I couldn't both be floored by what happened, because we still have two little kids to take care of. So I was just trying to be as strong as I could." Jen and Aaron hold Sky before she is taken to the NICU. 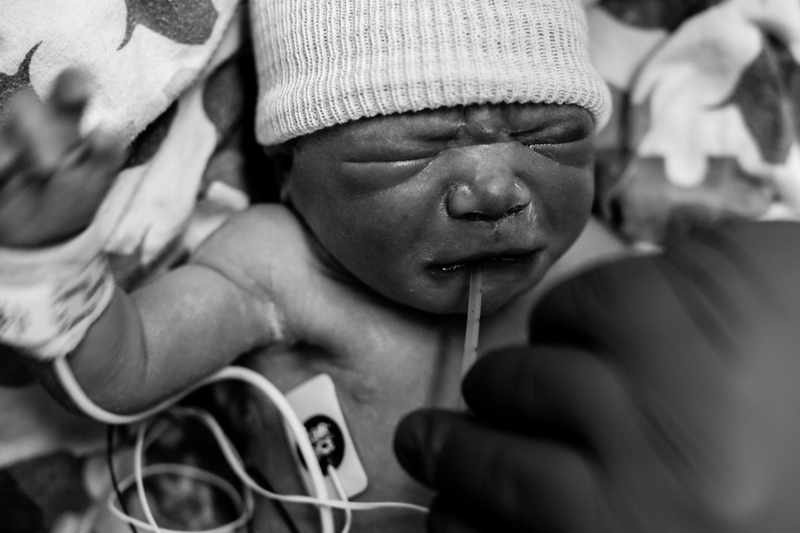 Sky was observed in the NICU for 6 days before being released to Jen and Aaron. The cardiologist found an additional defect with Sky's heart, but found that her defects were temporarily having a balancing effect on one another. Jen was told that Sky would need to return for her first open heart surgery likely sometime within the first 3 months. 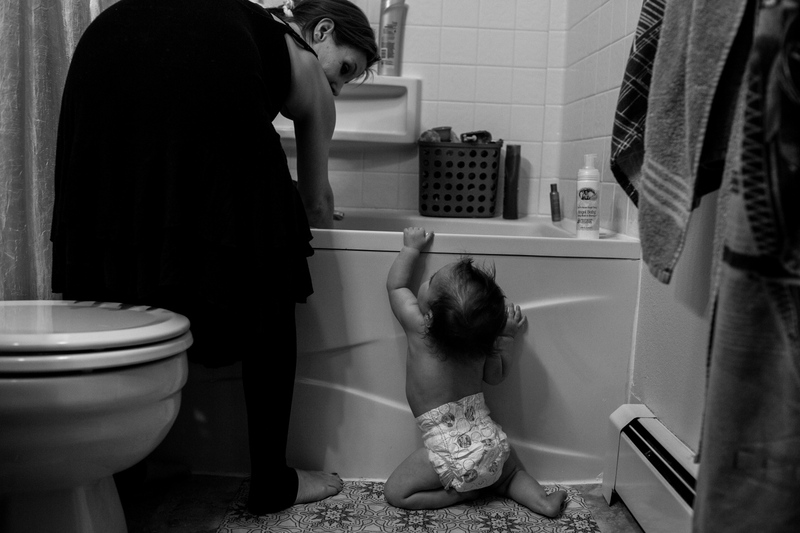 Jen bathes Sky for the first time at the Ronald McDonald House, six days after birth. Aaron, tired from a long night of work with the fire department, listens to Jen talk with the doctors at Providence Medical Center in Anchorage, Alaska. Sky's heart stopped in the early morning hours while Aaron was working, so she and Jen were rushed by ambulance to the hospital. Jen says that Aaron had been in denial about the severity of her conditiion since she was born, and that it was the first day that Aaron "got it" and she felt like they were on a team again. 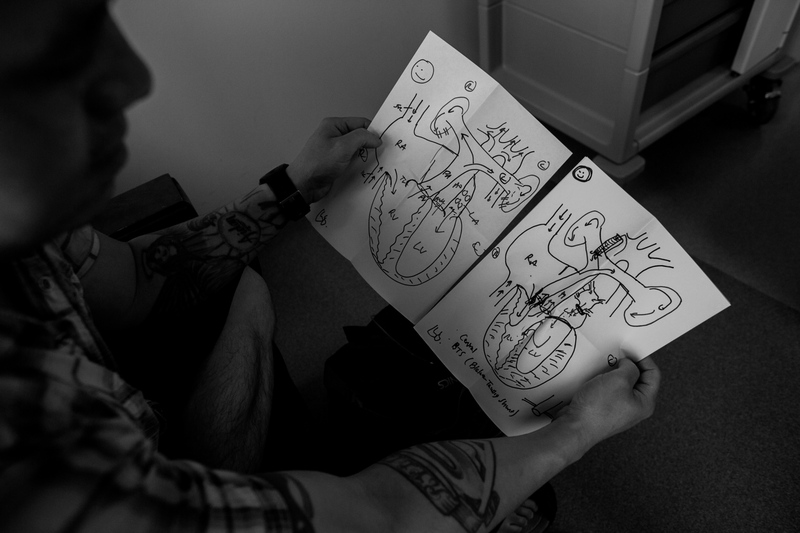 Aaron looks over the cardiologist's explanatory drawings of Sky's heart and the surgery she would need the following week. Jen soothes Sky during a TET spell the night before her surgery. 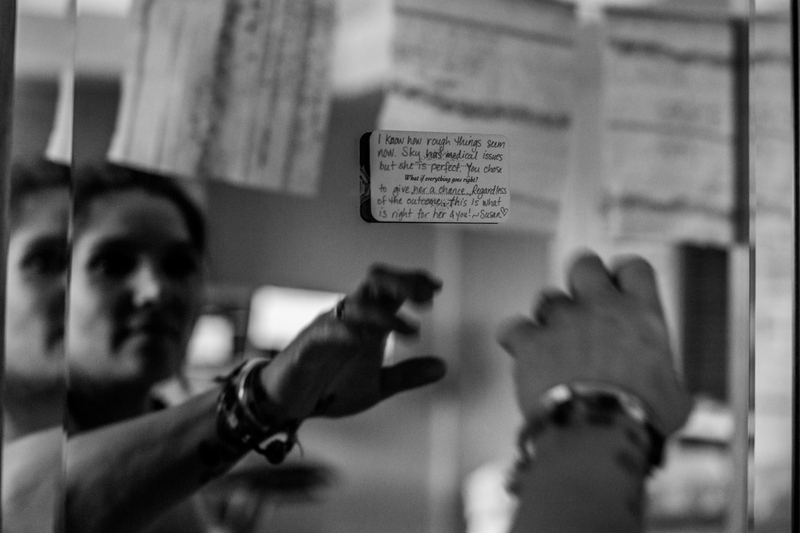 "The TET spells were terrifying,"Jennifer says. "She would just turn blue, look into my eyes with panic, and clutch so tight onto me. All I could do was hold her close to help her relax until she passed out." Jen and Sky, preparing the morning of her surgery. 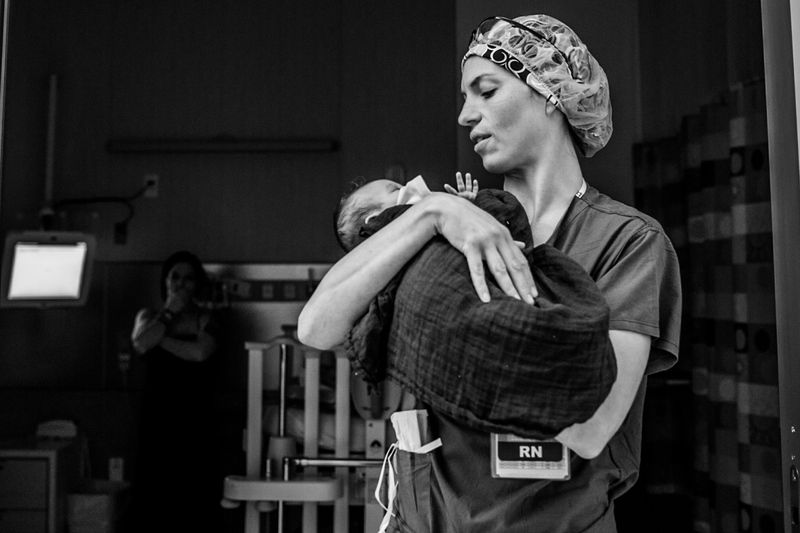 An OR nurse carries Sky to surgery at Randall Children's Hospital. Jen sees Sky for the first time after surgery. She is on a ventilator and on a paralytic drug to keep her immobile. Medical staff explain to Jen the functions of all of the various tubes and machinery. 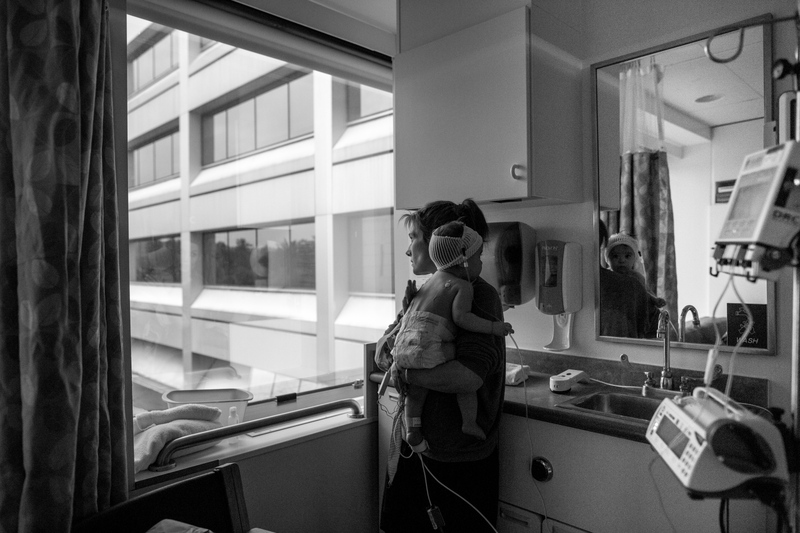 Jen holds Sky in her step-down unit at Randall Children's hospital. 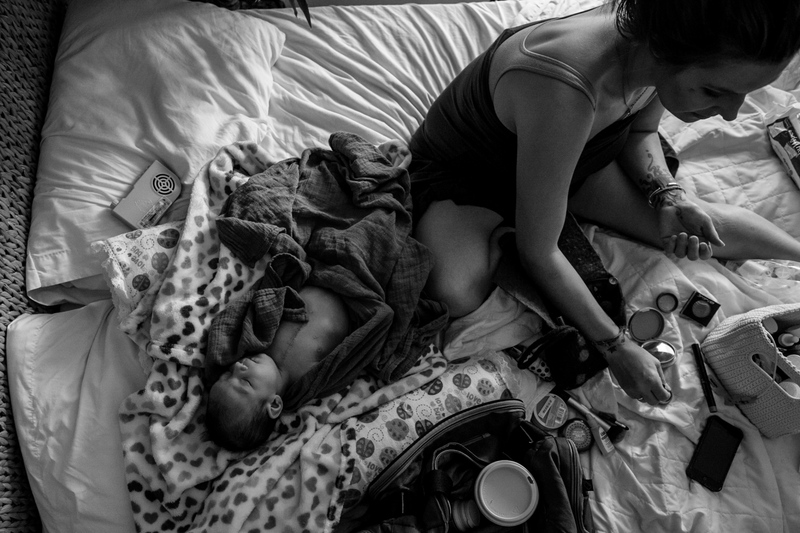 Jen insists on breastfeeding Sky as she would any of her other children despite the many ways that she is tethered to the medical world. Back in the room at the Ronald McDonald House almost a month after Sky's surgery, Jen puts on make-up for the day while Sky sleeps. Sky suffers from medication withdrawals and exhibits what Jen thinks are post-traumatic symptoms, but she stays calm as long as Jen is nearby. 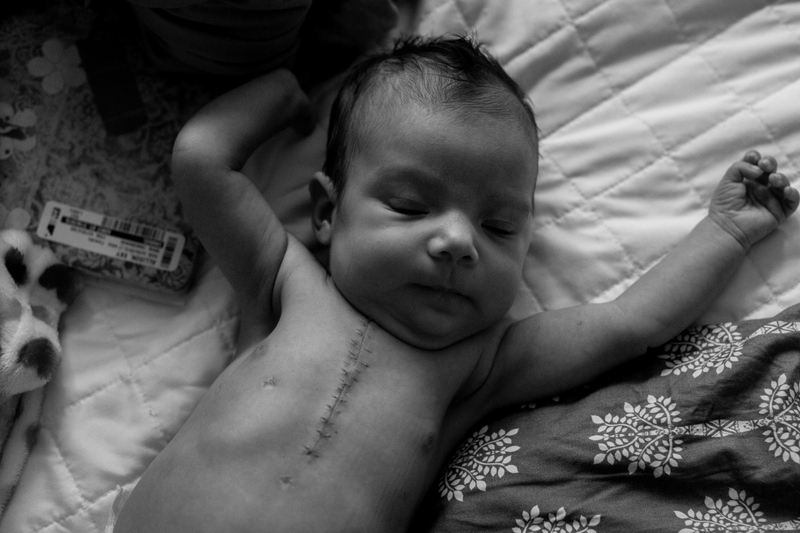 Sky, napping, several weeks after her first open heart surgery. Back in Eagle River, Jen plays with Sky as Story, 4, runs past. Jen has transfered Sky's care to Seattle Children's Hospital. Sky was sent home with a feeding tube to help her gain extra weight. Jen is still nervous and knows that her next heart surgery is just on the horizon. 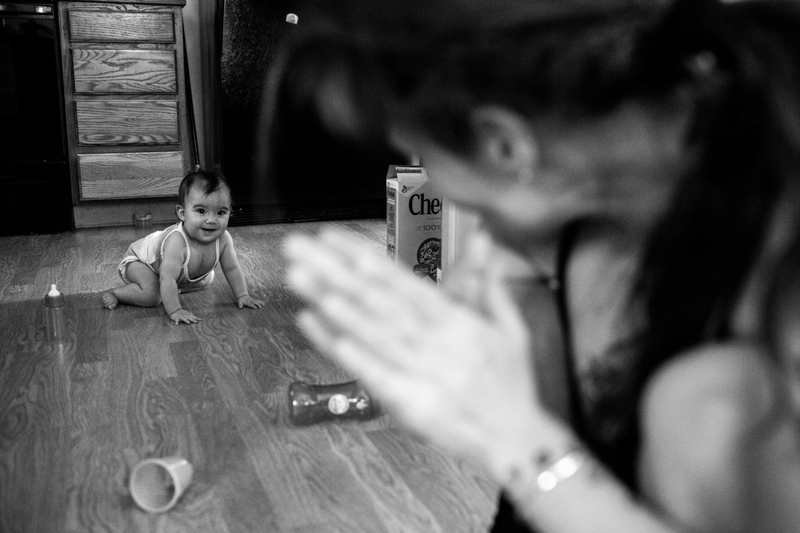 Sage, 2, Jen, and Sky, play in their bedroom in Eagle River, Alaska. Jennifer changes Sky into a dress before making photos a few days before heading back down to Seattle for Sky's second heart surgery. She removed Sky's feeding tube for the photos. 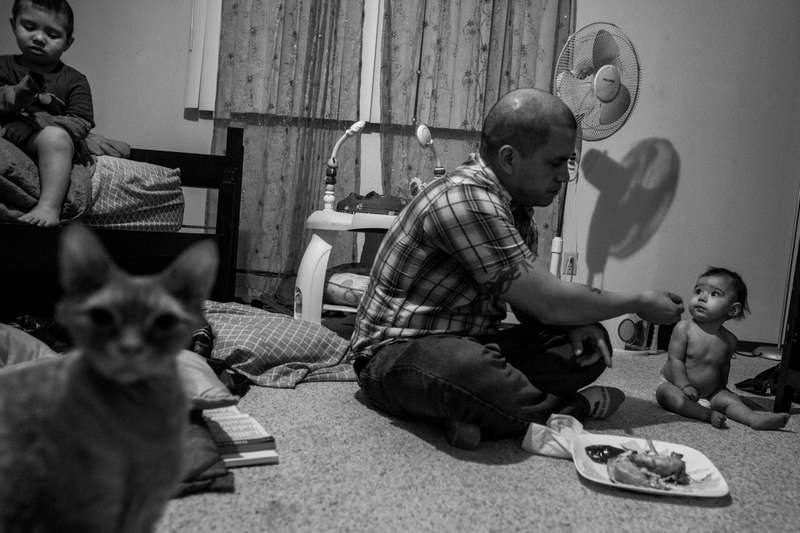 Aaron feeds Sky off of his plate in their bedroom in Eagle River while Sage, 2, watches a movie. "She loves to eat," Aaron says. "We have to cut her off usually so she doesn't get sick." 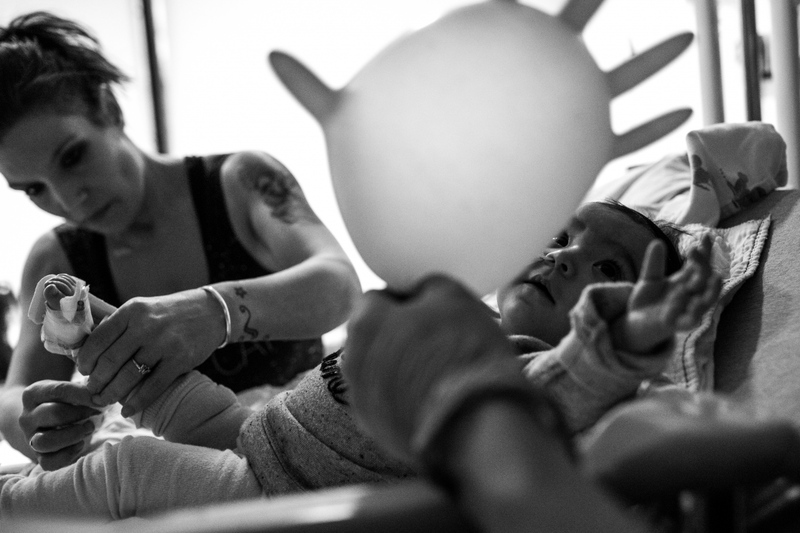 Jennifer, who is trained as a nurse, changes a bandage while a nurse entertains Sky with a medical glove that's been blown up like a balloon. Sky was scheduled to travel down to Seattle Children's for surgery this week, but contracted RSV and was hospitalized for 4 days in Anchorage at Providence Medical Center. Sky's cardiologist in Seattle decided to postpone surgery for another month while she recovers. 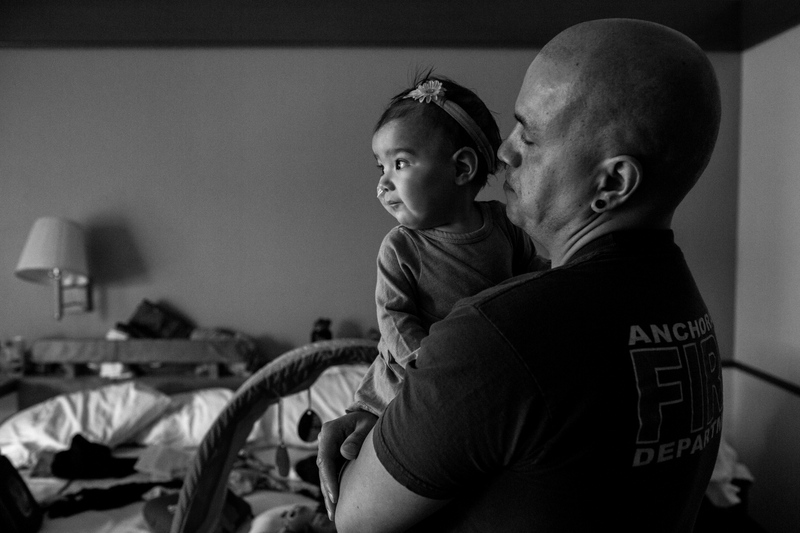 The family flies down to Seattle for Sky's second heart surgery. While waiting for a room to open up at the Ronald McDonald House, Aaron bids on a hotel on Priceline and is booked in a four-star hotel downtonw, the Palladian. Upon checking in , they were upgraded to a huge suite in the boutique hotel after front desk personnel inquired as to the reason of their visit. Jennifer paints Story's nails while holding Sky in their hotel in Seattle. While doing this, she learns that a room has opened up for them at the Ronald McDonald House, and they will be moving in the following day. Jennifer looks to see how Sky's three new teeth are coming in. Aaron holds Sky at the Ronald McDonald House the day before her second surgery. 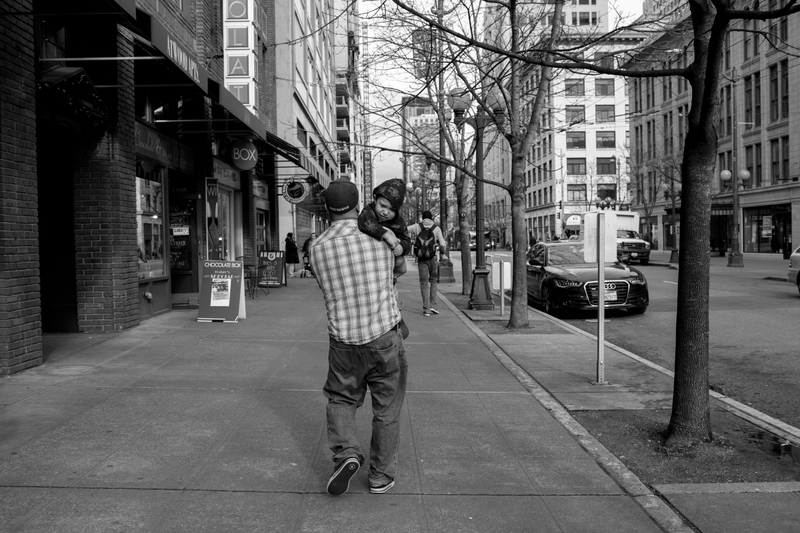 Aaron carries a tired Sage after an afternoon spent in downtown Seattle before Sky's second surgery. While Sky is in the hospital, he takes leave from the fire department and is the primary parent to the other children. Jennifer drives with Sky to pick up ingredients to make her a birthday cake on her birthday. Although parents in the U.S. are encouraged to place children in car seats in the back, Jennifer drives with Sky up front to make sure she is breathing. "It's the lesser of two evils," she says. Jennifer talks to Sky while bathing Story and Sage. Sky's gross motor skills have been just a little behind the developement of her other children, Sky is growing strong and pulling herself to standing. When Jen returns after picking up ingredients to make Sky's birthday cake, Jen is surprised to find a beautiful cake already there. Her friend, Susan, had dropped it off while she was out. Jen was working at the birth center where Susan delivered her baby, Jenny, who Susan named after Jen. 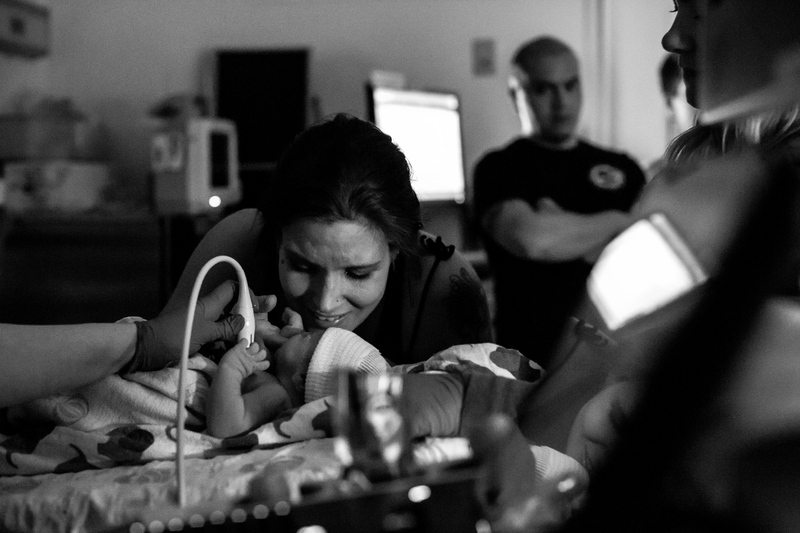 Jenny was born with a heart defect that Jen noticed shortly after Jenny was born. 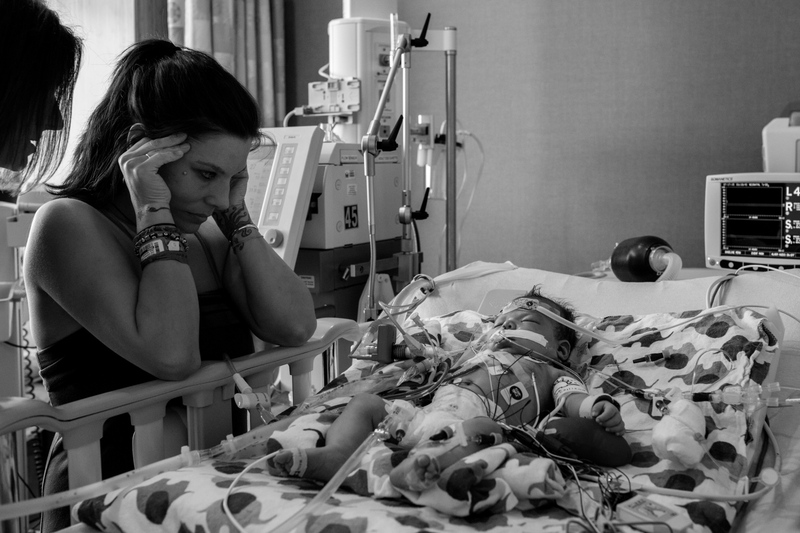 Jenny was flown to the same hospital in Portland where Sky had her first surgery, Randall Children's Hospital, and is now 7 years old. 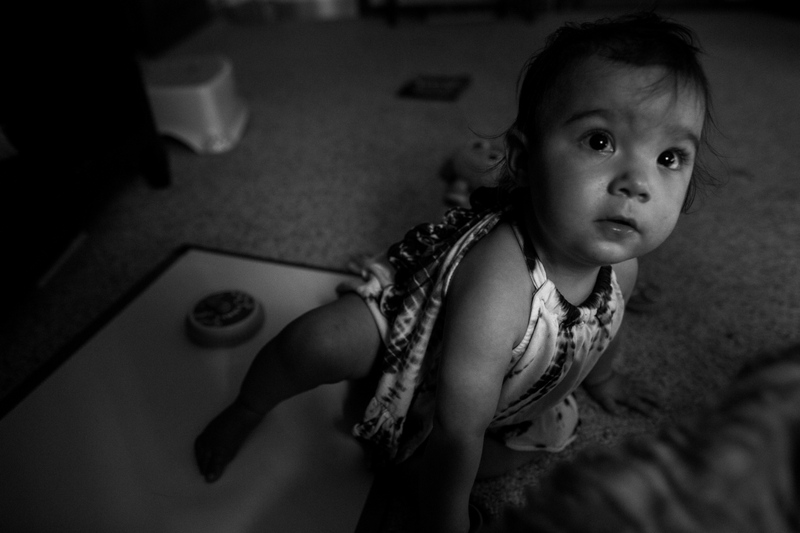 6 days after she turns one year old, Sky starts crawling. "I am living this time with her with my whole heart. I know it's not going to last, and I don't care," Jen writes in a private Facebook post to the women she refers to her 'tribe.' "I'm not going to let anything darken her shine right now. Aside from getting her vitals/numbers and weight and meds, I can almost pretend she's normal. I constantly feel like I'm forgetting to do stuff for her because I'm not used to her needing to little. The biggest change of all is she's gaining courage to explore life beyond my arms. This makes my heart soar." Jennifer plays with Story, Sage, and Sky in their bedroom. After returning home to Eagle River, Jen remodeled the kids room with DIY projects like creating hanging pods for the kids. "I want this to a place where they can have quiet and calm," she says. 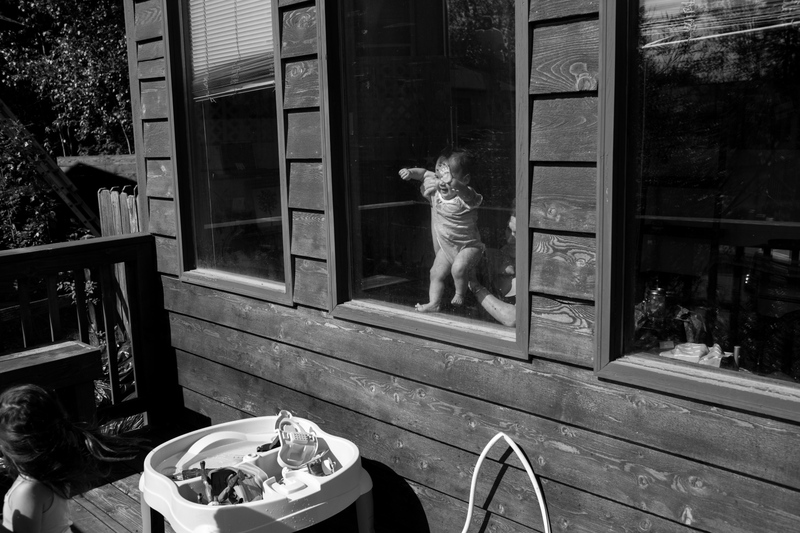 Sky watches her siblings play in a water balloon fight outside. Jen is fighting a migraine that she believes is likely from stress. 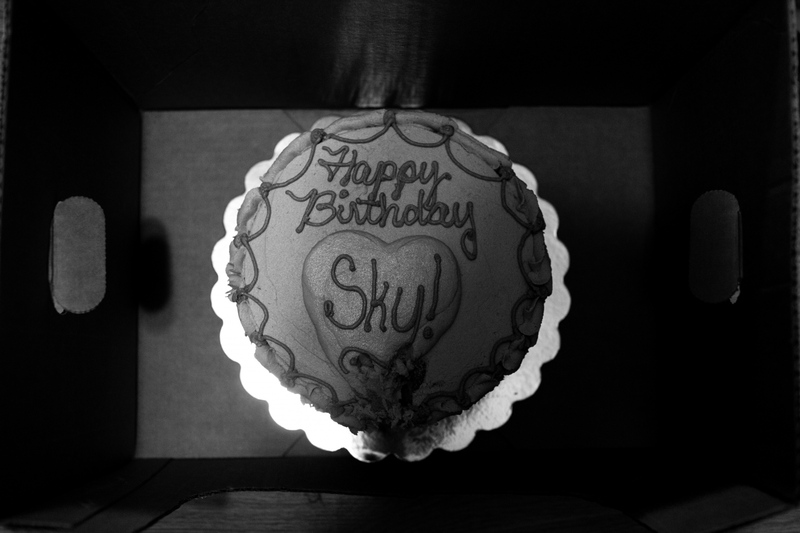 Sky, several days after her first birthday. 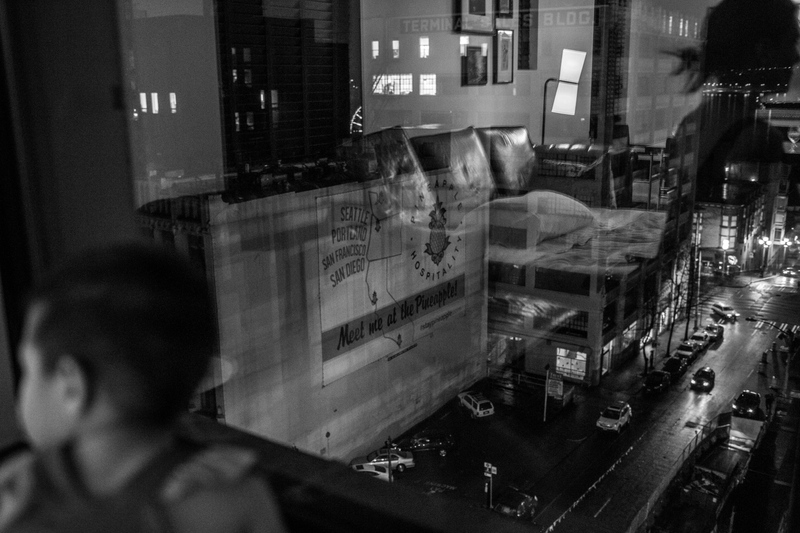 Jennifer looks out the window from her PICU room at Providence Medical Hospital in Anchorage, Alaska at night. That morning, Sky had started throwing up blood, a sign that may be related to her intestinal abnormalities. They spend two nights in the hospital befor heading home to Eagle River. Once Seattle Children's Hospital is consulted, it is decided that Sky will need surgery that fall.